Crows feet (lines fanning out from the outer edge of the eyes running toward the temples and cheeks), some people regard them as a sign of wisdom, but if you’d rather they were gone, they are generally simple to treat. The best method again depends on the depth of the lines and thickness of the skin, but they can be treated with peels, micro-needling, mesotherapy, Botox®/Anti wrinkle injections or Dermal Fillers, again the advantages and disadvantages of each will all be discussed with you at your free consultation. 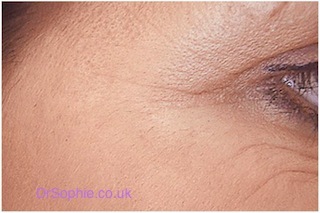 One of the simplest ways of crows feet treatment is with Botox®/anti wrinkle injections, one of the advantages of this is that the outer part of your eyebrow can be lifted to give a more flattering shape to your eyebrow. One of the simplest ways to treat these is with Botox®/anti wrinkle injections, one of the great advantages of using Botox® is that there is virtually nothing to see on leaving the clinic, you can just go back to your routine and no one need know your secret. Although you should avoid strenuous exercise for around 4 hours afterwards or a massage within 24 hours after treatment. Ring 0203 556 1753 to make your appointment with Dr Sophie.